Kaiji season 2 episode 23 ~ but! but!! It looks so easy! 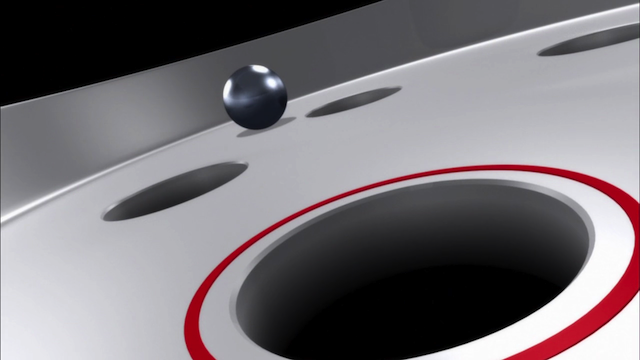 Just sink the silver ball in the red-rimmed hole, and get 7 trillion Yen. The incredible part of these closing episodes of the Bog arc of Kaiji is that it is up one minute, and down the next. Episode 23 of Kaiji season 2 continues in this fashion: now the machine is unbeatable, then Kaiji has a surefire plan, then that plan falls apart … and so on. In a sense, the whole purpose of watching Kaiji is not the plot, as much as it is the adrenalin rush. Which, I guess is a perfect representation of the gambling experience. Oh, dear. Things don't seem to be going Kaiji's way at the moment. The flip side of Kaiji’s emotions, of course, are those of Ichijou, the manager of the casino. Watching him wipe away his tears, and sob that he survived, is the equivalent of dropping from the top of a rise on a roller coaster; suddenly one’s stomach floats up into the throat. How can this be? Then, with a whoosh! the car reverses direction at the bottom of a new rise, and everybody is screaming, as Kaiji comes up with a new path to victory. I do love watching the crazy, adrenaline-provoking antics of Kaiji and friends. I have a hard time believing the live-action movie can be as intense and OTT as the anime, but with the anime wrapping up soon, I will probably jonesing for an adrenaline fix real bad. It is crazy. It is almost like the Bog really is a demon that is trying to devour both Kaiji and Ichijou. This episode made me SWEAT with its intensity and my rollercoaster of feelings closely followed that of the characters. You don’t find anywhere else an anime that can have me stand up while watching and acually scream, applaud, swear or rejoice out loud. 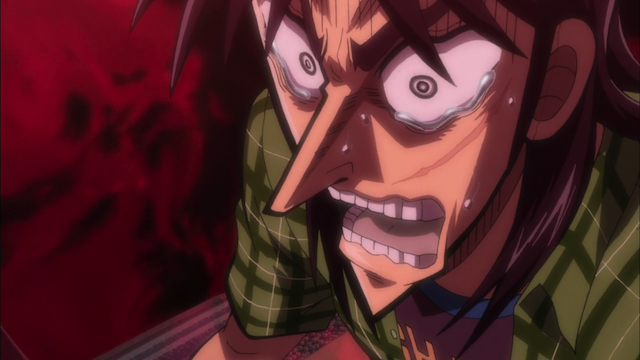 I enjoy Kaiji so much it is almost insane! I can only hope this second season is doing well in audience and sells and it’ll get a third season, and then a fourth. I guess if that’s the case they could announce it at the little section after the credits. I think they did something similar in the first season. Yeah, I’m going to miss this show. I’m looking forward to Phi Brain (Puzzle of God), which seems a little bit like season 1 of Kaiji, in that they have to competitively solve puzzles that put them in physical danger, but it will be tough to match the intensity of this show, or the psychological gamesmanship.